Dollar bill origami is also called money origami. As its name suggests, this type of origami uses money instead of paper. Sometimes, an existing diagram can be easily converted into a money model. Other times, because of the shape of money, new sequences of steps are needed before money can be folded into a $ origami model. [Photo: two $shirts]. It is interesting to note that US bills are 6.14 " X 2.61" (ratio of 7:3) and Canadian dollars are 152.4 mm x 69.85 mm (ratio of 13:6). Paper money from Britain, France, Japan, China, and Australia, and the EUR are all different sizes depending on their denominations. It is not clear when dollar bill origami began but origami historian, David Lister, has an article on Paper Money Folding in the BOS web site. He explains that folding paper money may have started as early as the 1800's. But it was not until the mid 1950's before money folds became significantly popular. This is documented in Robert Harbin's book Paper Magic (1956). Europeans are starting to fold money too as shown by Eurogami books which give instructions to fold Euros into origami models. Delightfully folded money can be given as tips, for example, in restaurants. They can also be given as wedding present, for example, a dollar bill butterfly. It’s an interesting twist to the age-old concept of cash gifts. [Photo by S Hecht]. Dollar bill folding can be done in any country, but it is particularly popular in USA. Why is this? It is not possible to explain the tendencies of the American public, but here is one possible reason. The lowest American dollar bill is worth $1, thus you can afford to fold and give away a dollar. In contrast, the smallest Canadian bill is $5; and in Mexico, the smallest bill is $10 neuvos peso. The smallest British note is 5 pound; and the smallest Japanese note is 1000 yen. In Europe, the smallest note is 5 euros. There are many diagrams for folding $origami models. On occasion, people will use money to fold modular origami models. Here, two or more bills are folded and combined to form a larger model. Shown on the left: This modular star is made from 5 Canadian five-dollar bills. 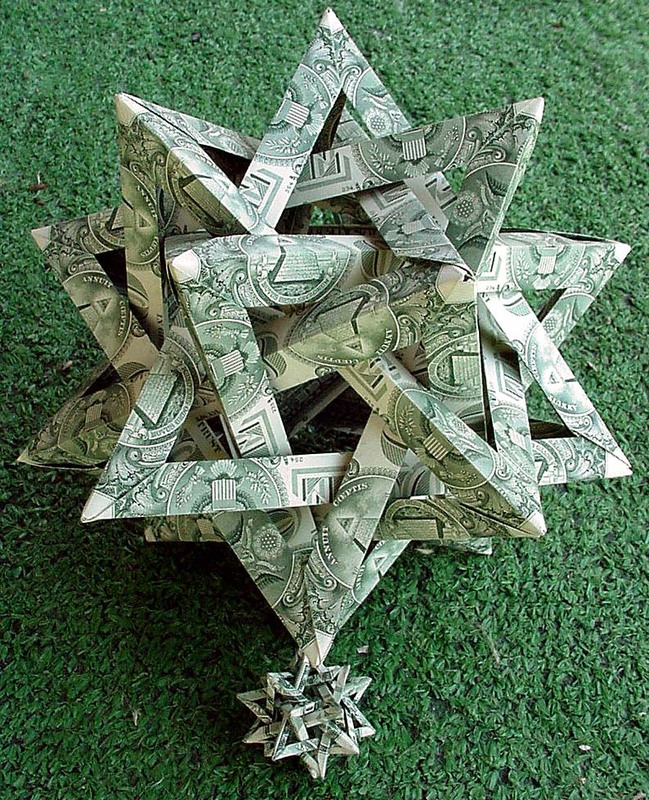 Joe Gilardi made Five Intersecting Tetrahedra using 30 USA one-dollar bills. Even more amazing is Stephen Watson's modular swan which is made of 500 (scanned) five-pound British notes. Equally amazing is Tine De Ruysser's 6 necklaces made from banknotes from 6 different countries (China, USA, Australia, Europe, South Africa, Argentina). Honestly, if you were to receive such wonderful dollar bill origami models, would you unfold it to use the money? Or leave the model folded?